A mother’s first-hand account of seeing her son ride a bike for the first time. This article was written by Nicole P. Basham for FreeFunInAustin.com. It was published on February 05, 2015. I thought it was never going to happen. I had almost given up trying to teach my son how to ride a bike. Four years ago, my parents bought him a bike for Christmas. We took it out on a ceremonial ride, with the training wheels on. He was five at the time. He was finally going to learn how to ride a bike! Many of his friends were already riding. It will happen, I told myself. Then, time went by. The bike gathered dust in the garage. 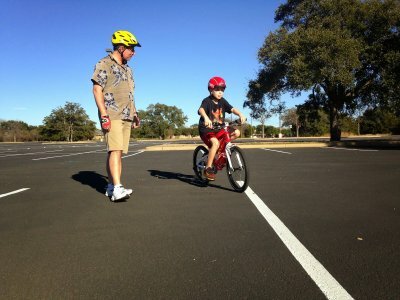 My son had little interest in learning to ride, and I wasn’t really sure how to teach him. During each school break, I made a mental list of the things I wanted to accomplish. 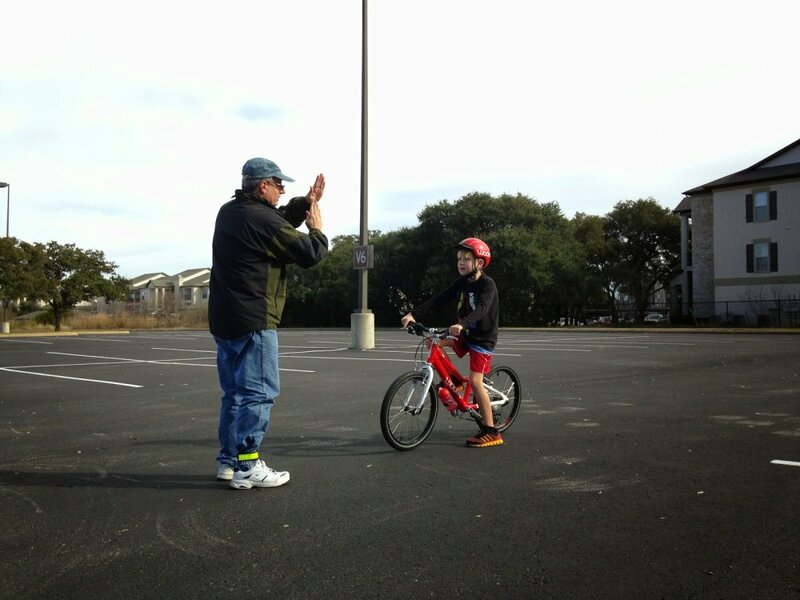 Learn How To Ride a Bike was always something I added to our bucket lists. Unfortunately, just adding it didn’t make it happen. I came to the awful realization that my son had probably outgrown his bike, and he still hadn’t learned how to ride. Meanwhile, I did some research and learned that there has been a shift away from learning on training wheels and to having children learning how to balance first and then getting them up on two wheels. This concept was even more foreign to me, although it certainly made sense. Frustrated that we had never gotten around to making this huge milestone a priority for our family, I remember telling my husband that I would willingly pay someone to teach my son how to ride. I knew part of the reason I had put this off for so long was that I wasn’t looking forward to the idea of pushing my kid beyond his comfort zone. I knew a third party would be better able to encourage him when he was ready to give up. I knew that if he got frustrated, tired or sustained any kind of riding-related scrapes or bruises, the process would be waylaid or postponed, yet again. Why shouldn’t we outsource this, since I obviously didn’t know what I was doing? Around this time, I learned about the Center for Cycling Education. Led by Allan Dunlop, an internationally certified cycling instructor, the Center offers both in-person and online cycling courses and workshops. 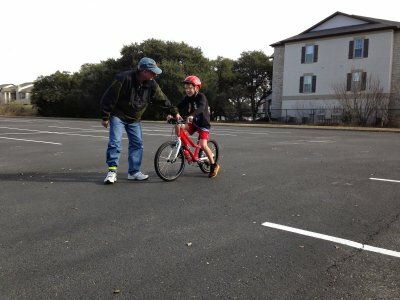 Allan has worked with kids as young as three or four years old — and plenty of adults who never learned to ride. Since he began working with individuals, organizations and cycling instructors in 2002, he has trained more than 6,000 students of all ages. 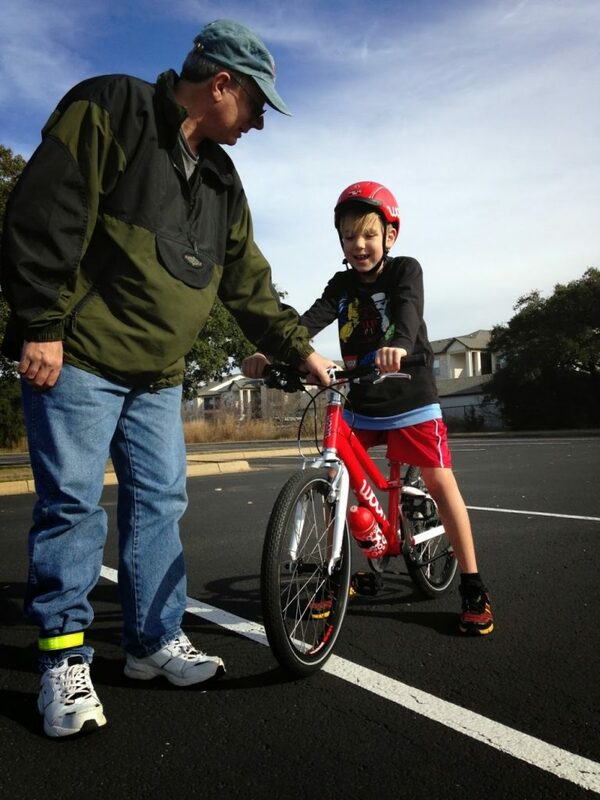 In addition to teaching how to ride a bike, Allan has developed workshops on traffic skills, commuting tips, bike maintenance and driver training. 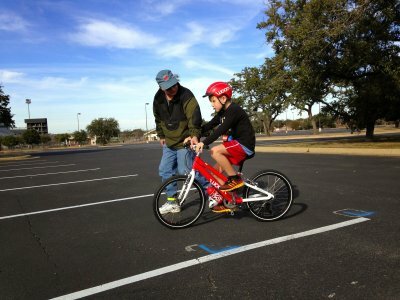 If you receive a ticket while on a bike in Austin, the Center for Cycling Education offers a ticket dismissal course. If anyone could get my kid up on two wheels, it would be Allan. Find out more about the courses here. / Contact us today to book your lesson! WOOM bikes are designed in Europe, especially for children. 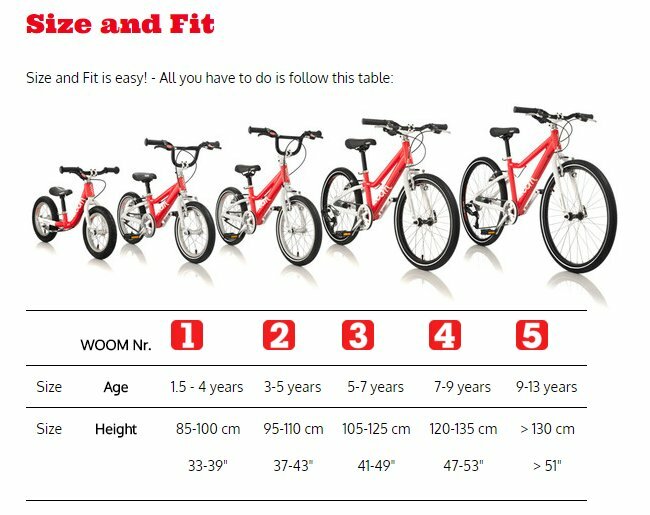 Bikes are available in five sizes. 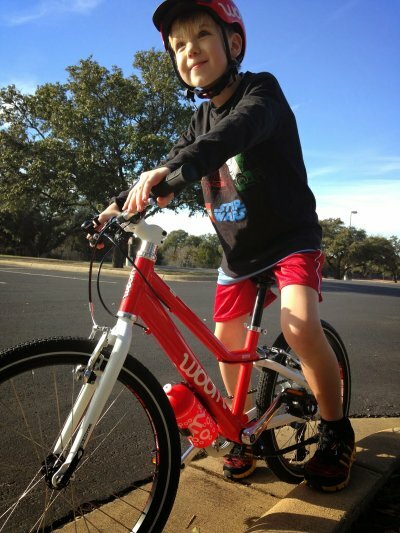 WOOM 1 is a training bike without pedals for children up to age five. 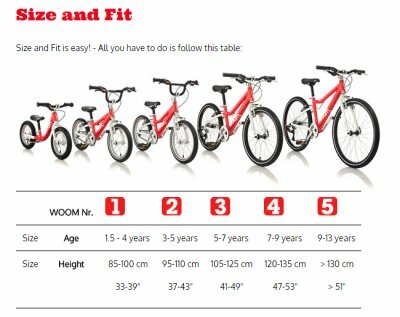 WOOM 2 has pedals and is designed for children ages three and up, and the largest bike is the WOOM 5, a 24-inch bike with 8 gears. Pedals can be spun backwards, making it much easier to get the bike in the proper position to begin riding. Front and rear handbrakes are easy for small hands to reach and operate. 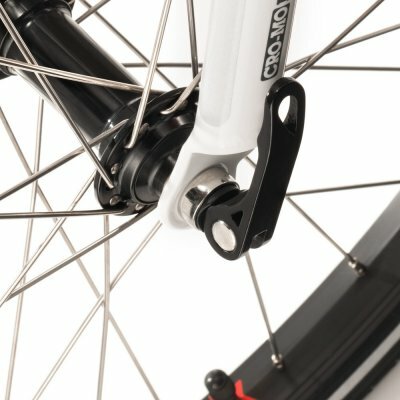 A quick release system allows the front wheel to be removed easily if you’d like to transport the bike in your trunk or car. 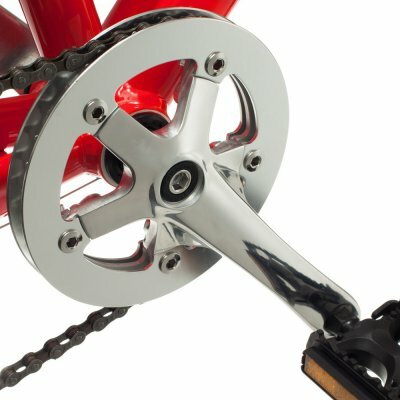 The company has an upcycling program which allows you to trade in a bike your child has outgrown and apply 40% of the original bike purchase price toward the next size up. 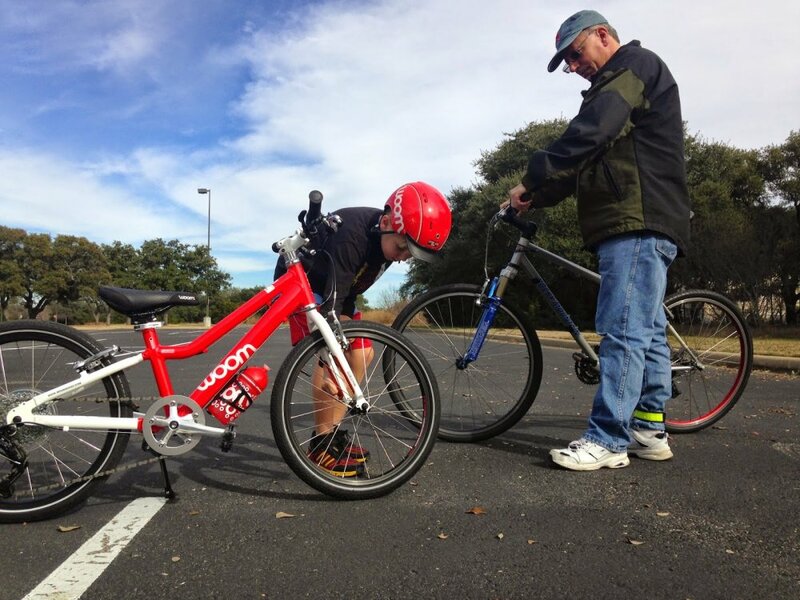 WOOM services the bikes, exchanges some parts and then works with non-profit organizations and programs in Texas to get more kids riding bikes. Bikes are made from lightweight aluminum tubing and lightweight alloy rims, so they are much easier to maneuver than most kids’ bikes. 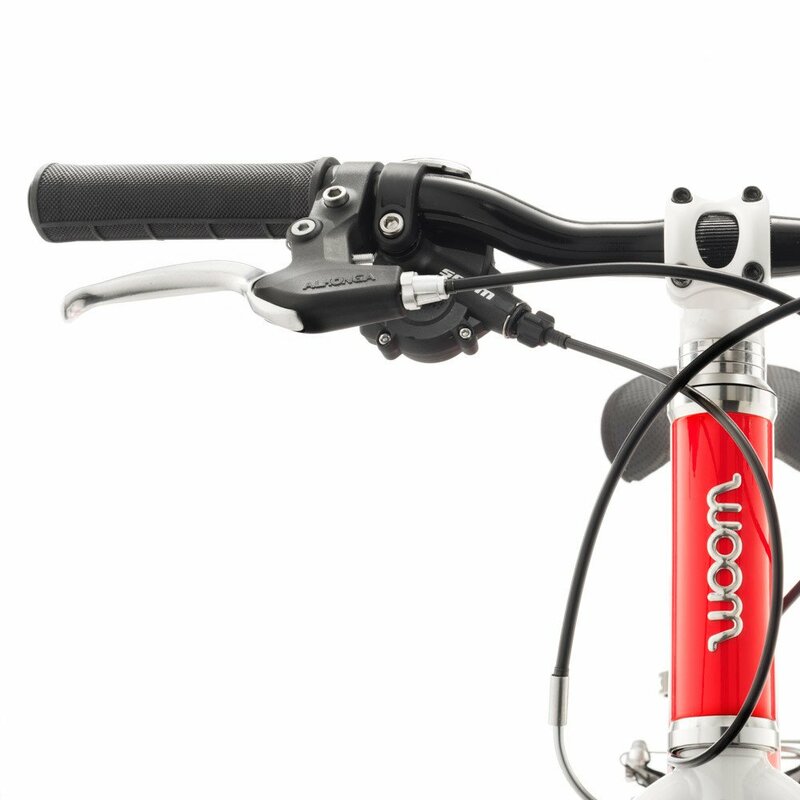 Each WOOM bike features non-toxic grips, saddles and powder coating and low-toxic tires. 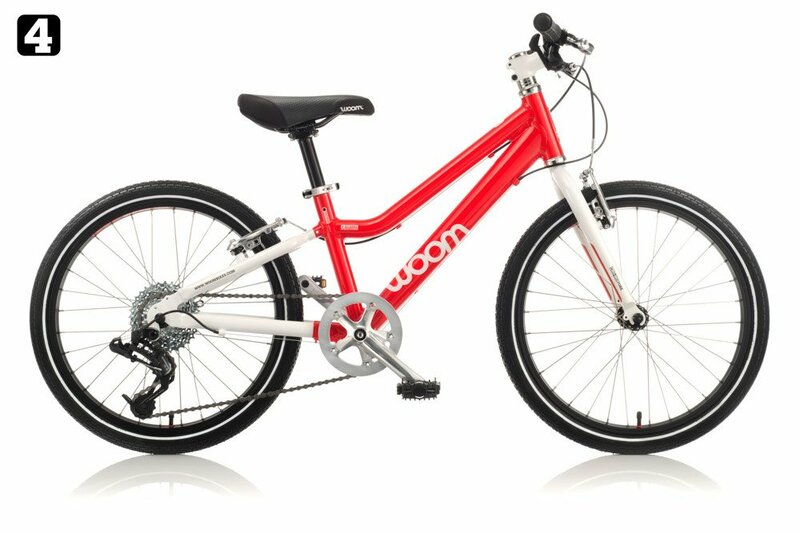 For more information about WOOM bikes, visit US.WOOMBIKES.COM. I learned that the WOOM 4 would be the appropriate size for my eight-year-old son. We opted to split the three hour training offered by the Center for Cycling Education into two hour and a half sessions — one on a weekend and one after school. Once we scheduled our first riding lesson with Allan, we loaded the bike and helmet into the car along with water and snacks for my son. We met Allan for the lesson in a parking lot with a gradual slope on a sunny day. After we unloaded, Allan led my son through a series of checks to ensure that both he and the bike were ready for riding. Over the next hour and a half, my son learned how to get onto the bike, the proper starting position, how to use the brakes, how to pedal and how to steer. It was amazing to see how far he could come in such a short time. Allan’s encouragement and positivity helped boost my son’s confidence, even on the few occasions when he managed to get a scrape and have to sit out for a minute or two. When Allan offered my child a chance to ride unassisted, he said he would prefer to get in some more practice first and Allan was very patient with him. My son’s enthusiasm was palpable as we pulled into the parking lot for our second session. I guess he knew more than I did how close he was to riding unassisted. It didn’t take long for Allan to remove his hand from between the handlebars and I felt myself holding my breath. He did it! Will’s very first solo bike ride! Once he got the hang of it, Allan showed him how to coast, change gears, ride over slight hills and make tighter turns. He even set out cones to help practice his steering. What my son seemed to enjoy the most was just riding around with Allan following on his own bike. I was expecting a few spills, but the work Allan had done with my son on braking earlier paid off; he know how to slow down and maintain control of the bike. I was elated. My son quickly fell in love with the WOOM bike. He reminded me that red is his favorite color. I had to request that he refrain from ringing the bell while Allan was attempting to offer instruction and he was a big fan of the water bottle. He was able to do most of the work in getting the front wheel on and off with the quick release system. Little did I realize I would have a junior spokesperson for the bike when our lessons were complete! Now I no longer have to look, wistfully, at the families taking advantage of our town’s amazing weather and nice bike paths and trails. We can now join them — just in time for warmer weather to arrive. Hooray! This article was written by Nicole P. Basham for FreeFunInAustin.com. It was published on February 05, 2015. 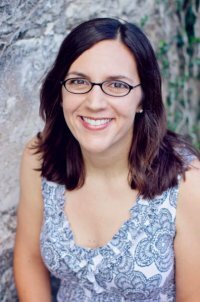 A recovering workaholic, Nicole Basham now spends her time rediscovering Austin through her 8-year-old son’s eyes. A soccer-playing mom, Nicole also enjoys tickling too close to bedtime, taking in some live music and being silly. You can also find her writing at LiveMom.com.